Chicago’s independent movie theaters face another hurdle in their fight for survival. 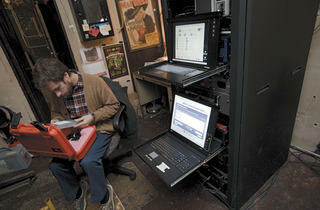 Photograph: Martha WilliamsDoug McLaren, projection manager at the Music Box Theatre, loads a digital movie. 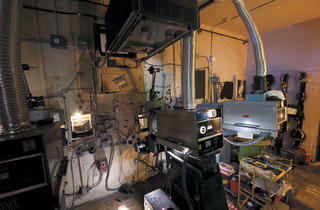 Photograph: Martha WilliamsDigital and analog projectors exist side by side at the Music Box. 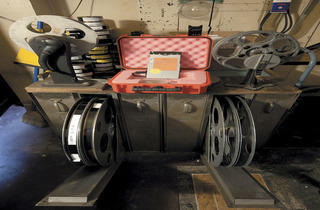 Photograph: Martha WilliamsDigital and analog film technology exist side by side at the Music Box. IT’S A FAR CRY FROM FILM REELS and metal cans. As we walk the upper level of the South Loop’s ShowPlace ICON, which opened in 2009 as the first multiplex in Chicago without traditional 35mm projectors, the overall impression is one of motorized sleekness. The lights are off—there are movies running, after all—and the corridor has a cavernous, unfinished feel. Phil Wittlief, the theater manager, shows me a computer screen attached to one of the projectors. The monitor displays info: “Showtime: 1:40–3:28. Ends in: 107 minutes.” Trailers are cataloged in a playlist. At 1:39, a bulb heats up, and the previews before Journey 2: The Mysterious Island grace the screen. Our next stop is the theater’s central office. Behind the desk is a rack of orange suitcases, each the size of a laptop. Inside every one is a rectangular, metallic box that resembles a disk drive. This is what movies now look like. Given the packaging, you might easily mistake them for biohazards. Digital projection may not be a virus, but it is spreading. As of the end of February, 67 percent of the nation’s screens—in 54 percent of its movie houses—had already replaced their analog projectors with the techno-wizardry I saw at ICON, according to Patrick Corcoran, a spokesman for the National Association of Theatre Owners. In Chicago, that change has been pronounced. Apart from the art-house Gene Siskel Film Center, it’s no longer possible to see a 35mm print downtown. Even the Music Box’s main screen has a digital projector, suspended from the ceiling above its 35mm counterpart. By 2013, Hollywood will have stopped making celluloid prints of new movies, forcing owners of smaller theaters to make the switch to digital. The Downers Grove–based Classic Cinemas accelerated its conversions in December. By the time you read this, all 100 of its screens at 13 theaters throughout Northern Illinois will be digital—which means the “film” you see at Classic Cinemas is not technically a film at all. The reasons for the shift are well documented: Movie studios will save on the cost of lab work and shipping; theaters will theoretically have more flexibility shuffling titles from screen to screen. For filmgoers, the difference may seem irrelevant. “Most patrons care about what is on the screen, and not how it gets there,” says Classic Cinemas president Willis Johnson. But the change has far-reaching implications for the way cinemas do business—affecting everything from what movies you see to theaters’ survival. We may look back on the digital revolution as the moment that ended movie theaters as we know them. CINEMA OWNER DEMETRI KOUVALIS spent more than $40,000 to spruce up and reopen the Northwest Side’s 1929 Patio Theater with his late father, Alexander, last June. He knew the digital shift was progressing, but he didn’t expect 35mm would be gone so quickly. 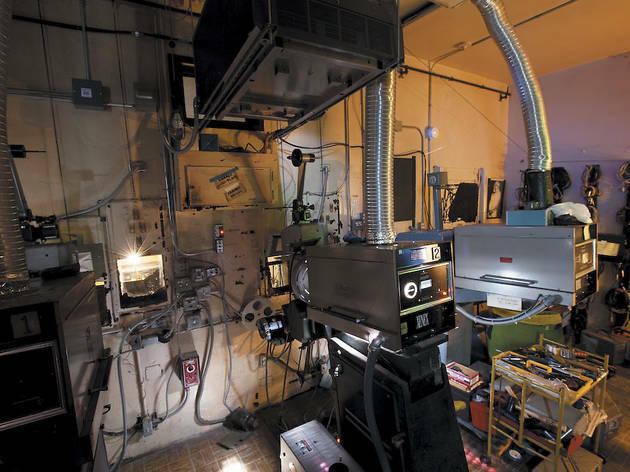 The cost of switching to digital projection runs between $50,000 and $100,000 a screen, according to a series of articles by film scholar David Bordwell. Hollywood, attempting to ease theaters’ pain, has jerry-rigged a series of complicated financial arrangements to help subsidize the conversion. The specific terms of the deals are confidential, but in general, a theater owner buys a projector from a third party, paying for it in installments. Movie studios, in turn, underwrite some of the projectors’ cost, paying the third party using their savings from not making 35mm prints. The problem, Kouvalis explains, is that the deals can place restrictions on a theater’s programming. “[The arrangement] doesn’t work with [non-chain] movie houses, especially for me as a one-screen,” says Kouvalis, who likes to change his movie every week. His only other choice is to buy the projector himself—a purchase that will cost more than rehabbing the theater. He’s looking into a “Save the Patio” Kickstarter campaign. The proliferation of digital is also bad news for art-house films, which stand to lose a home. Ted Mundorff, CEO of Landmark Theatres, worries about the effect new operating costs will have on titles shown. Because they’ll now have to pay for digital projectors, movie theaters will need bigger profits than before—and will be less likely to take a chance on a low-grossing indie film. Among the drawbacks: As with much technology, older models face obsolescence. The digital projectors used just ten years ago are too primitive to play a film made today, Kraus notes. Classic Cinemas’ Johnson bought 25 digital projectors between 2005 and 2011 but replaced them in December. Visual technologies giant Christie had come out with a higher-resolution model, and he wanted to take advantage of it. These kinds of issues weren’t posed by 35mm, a versatile technology that survived the leaps to sound and widescreen. A projector built in the 1930s can still be equipped to “put out a state-of-the-art picture,” Kraus says. 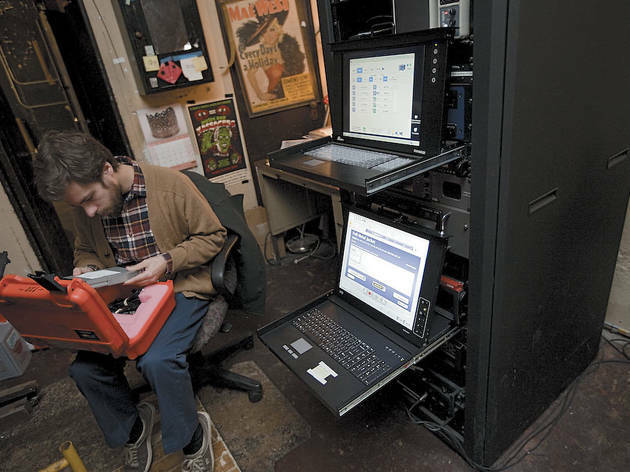 “That’s not going to be the case with the digital projectors, because it’s all proprietary chips and circuit cards.” If a company stops making replacement parts, he fears, theaters may have no choice but to buy new equipment. Corcoran says standards agreed to by studios and exhibitors were designed to prevent such chronic overhauls, and he expects the technology’s cost will lessen over time. Johnson, for one, says he wouldn’t be able to afford the kind of upgrade he started in 2005 again and again. Such costs might force theaters to close. Though Johnson isn’t too worried—he anticipates mostly minor software tweaks—the idea of costly repurchases isn’t far-fetched. 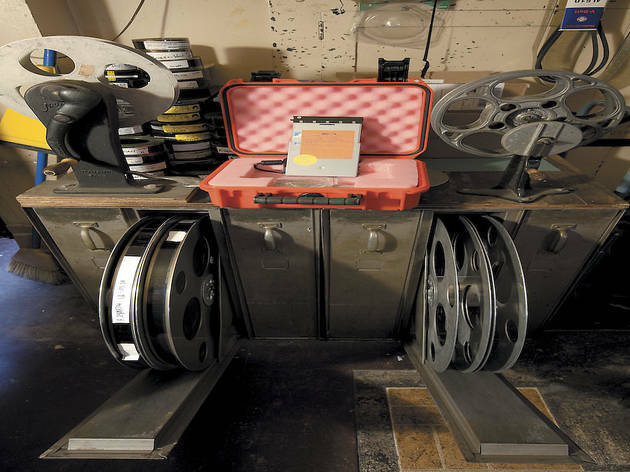 Once the digital conversion is complete, says Chapin Cutler, a technical consultant for festivals like Sundance, projector companies will be under financial pressure to sell an updated product. “There aren’t many of us using a 2002 computer with Windows 95 in it,” he says. Becca Hall, who projects at the Siskel and runs a classic-film series, the Northwest Chicago Film Society, with Julian Antos and Kyle Westphal, points out another flaw with digital: If a pixel burns out, the result will be worse than a scratched print. The imperfection, similar to a broken spot on your iPhone, will persist from film to film until fixed—a prohibitively expensive repair once a projector’s warranty is up. How many gigabytes is Casablanca?